Last night, while I was flipping through Facebook looking for examples of the recent meme where Israeli citizens post the message: “Iranians. We will never bomb your country. We ::heart:: you” over their pictures, I noticed a tweet from fellow academic Katy Pearce, who speaks Armenian, about how the word “pisi” means cat in Turkish, Farsi, Armenian and Azerbaijani. 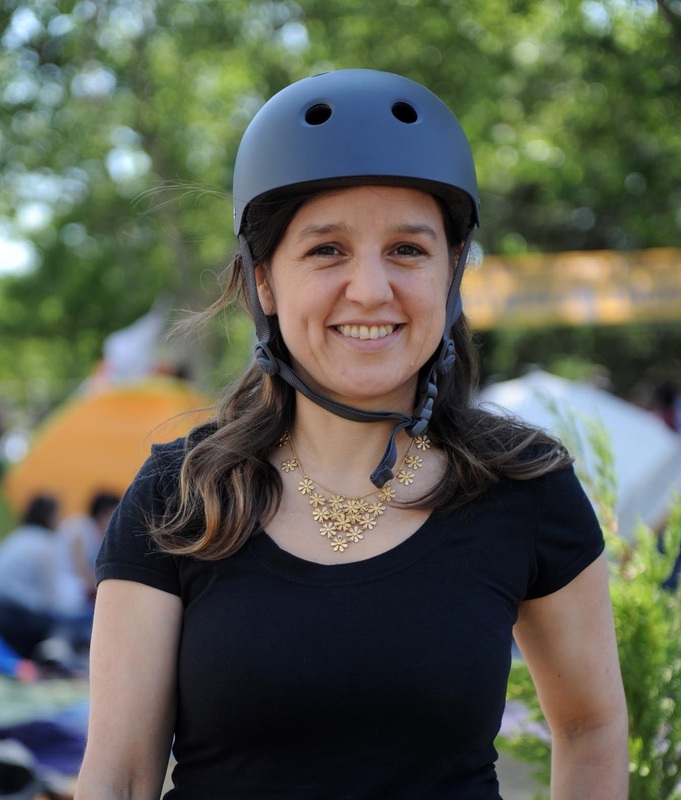 I responded that in Turkish, it was mostly used in baby talk, or to call out to cats: “come here pisi, pisi.” We got into a fun conversation about shared words in the region–and were soon joined in by others. The word “kef” came up. Katy said it meant to “party” in Armenian. Someone pointed out that it meant to “get high” in Uzbek. Another said that it refers to weed in Hebrew. We soon realized that it also had a similar connotation in Russian. I thought that it might all be related to the word “keyif” in Turkish which means pleasure in a sensuous sense. But the word, it seemed, was everywhere and everywhere in the region. What gave? A little bit of Internet sleuthing later, Wikipedia gave us our answer. In different incarnations, Wikipedia dutifully informed us, the word kef –kief, keef, kif, kef—refers to “resin glands of cannabis” which apparently contain higher concentration of psychoactive cannabinoids. And the word, in all its incarnations, appears to have derived from the Arabic word “kayf” which connotes pleasure and well-being. A vice of pleasure, it seemed, had gone viral, at least linguistically. Already sleepy, images floated in my head about how this phrase might have spread and take such strong root through this war-torn region. I had visions of an underground of devotees of hashish, smuggling their vice of choice among each other—would they continue their trade as wars broke out between the countries? Would they speak each other’s languages beyond a few words? Would they sit around and get high together? Would a drug deal gone bad ignite more violence? I don’t mean to glamorize use of pyschoactive substances—I’m aware that one person’s pleasurable vice can be another’s addiction hell. Still, though, I was intrigued in the kind of human contact that must occurred to spread this word to so many corners—especially considering that nowadays, ordinary Armenians and Turks –and for that reason Greeks, Russians and Arabs as well– often have very little day-to-day contact with each other. My thoughts were also with another past war yesterday was also the anniversary another major war, the Gallipoli campaign (“Canakkale” in Turkish) of World War I. (The Australians commemorate the battle as “Anzac Day” on April 25, while Turkey remembers it on March 18th.) About half a million people lost their lives in that fateful battle—many from as far away from Australia. I never cease to shiver at the horror of a world that brought young man from as far away Australia to what was then the Ottoman Empire, half a world away–to kill and die among people they had never seen and never would again. Hence, as it is probably the case on Anzac Day in Australia, there was a lot of news coverage in Turkish newspapers about the bravery and sacrifice of the soldiers –often peasant conscripts—who lost their lives in that battle. Yet my inbox had a counter feeling. A more thoughtful friend sent me a song from Australia: “And the Band Played Waltzing Matilda.” I hadn’t heard it before. A haunting first-person indictment of the folly of war, the song is told through memories of a young man who lost his legs in Gallipoli, as “corpses piled higher” even around him. My friend said another friend had sent him the song. I thought about a network of people tuning out the official speeches that speak of a false glory of war, and instead share stories about its reality with each other. What if we could do this before the soldiers got on the ships? Would a world in which the reality of war is more visible also be less likely to fight wars? In his latest book, “The Better Angels of Our Nature: Why Violence Has Declined” linguist and Harvard professor Steven Pinker argues that level of war violence has gone done down dramatically in the 20th century. I’m only somewhat convinced. These days, most war deaths occur in the peripheries of battlefields—the collateral damage, the spiking infant mortality, malnutrition, disease. From Iraq to Afghanistan to the Democratic Republic of Congo, large numbers of people continue to die from wars, but fewer and fewer of them are soldiers on the battlefield. Still, though, there is little doubt that the ratios of war deaths have gone down even as the numbers remain significant. 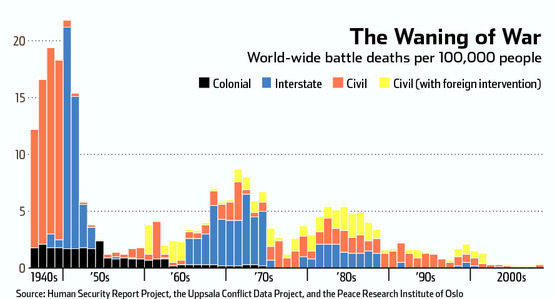 Major wars used to kill tens of millions of people—and would still do if another one was fought. Does globalization and increasing human contact decrease chances of wars? People had high hopes that radio, which started out as a two-way communication technology, would do just that–decrease wars by increasing human contact. Yet, Radio was shut down from its early interactive form right around World War I—and became, essentially a military technology. So perhaps history is not hopeful. Yet, there are reasons to think that human-to-human “diplomacy” is a more potent force than the past attempts. Unlike early radio, the interactivity of Internet platforms is vastly more advanced and is used every day by billions of people. Plus, a kind of “Globish” –a limited English– has indeed emerged as a shared language. As the spread of Kony 2012 video shows, there is also tremendous interest in humanitarian fables–albeit in flawed an overly-simplified form as it was the case with that particular campaign. Which brings me to my point: the greatest power the public sphere has is the act of granting of consent and the conferring of legitimacy to governments. And that is where the Internet has been a game-changer. Often, it is erroneously thought that rulers rule through force–and dissidents have legitimacy on their side. In reality, it is almost always the other way around. Consent and legitimacy among the population is the true the coin of all rule, including undemocratic and authoritarian ones. Once the rulers lose legitimacy, they often also lose their control over force. Militaries refuse to go out of their barracks to save the regime, or turn against their old patrons. The police disappear from the streets. Elite divisions accelerate. Ruling more through force than legitimacy requires draconian control over the public sphere. Hence, such regimes are thus distinctly vulnerable to disruption of new communication technologies like the Internet. I would like to strongly note that I am not equating legitimacy among the population with democracy, or with liberalism, or with values that may be close to my own heart. Legitimacy can also be garnered through intolerance, extreme nationalism, and even, unfortunately, war-mongering. Hence, if one looks at cases where the spread of the Internet did not challenge authoritarian rule, one often sees a combination of different amount of two dynamics: a draconian attempt to keep control over the public sphere through the emergent challenge posed by the Internet *and* a good deal of legitimacy. Hence, from China to Russia to Iran, authoritarian regimes rule partly because they continue to have sizable amount of legitimacy among portions of their public (something Mubarak did not have as much in Egypt). Thus, often, the strongest political act that a populace can do is to actively and publicly withdraw their consent and refuse to confer legitimacy on a particular regime—or, in this case, a war. This is not to say that active withdrawing of consent guarantees to stop a war; but it certainly complicates efforts towards one. At a minimum, active displays of dissent can challenge a condition political scientists call “pluralistic ignorance”; i.e. when people privately hold beliefs that they believe are the minority but are in fact majority but hidden from view because people keep their preferences hidden. And Facebook and such platforms make it easy for people to easily reveal their true preferences—and to start rapid cascades. (Speed with which such things can spread is a very important dynamic as slow and fast diffusion do not create a little less or a little more of the same thing-they create very different consequences.) Hence, I am obviously not saying that Facebook postings are enough. However, if there was enough dissent within Israel towards a war with Iran, viral Facebook postings indicating such dissent would certainly be one active way of intervening in the public sphere and challenging the legitimacy of a pro-war drive. What’s new and interesting about campaigns like the “We love Iran” is that they are easy enough for ordinary citizens to do. The fact that they are significant speaks to failure of our conventional politics–in almost all developed nations, the institutional connections between citizens and levers of power have become weaker. The real critique should not be that the Internet is not enough to fix politics, but that most of politics has become so heavily dominated by insiders and the already-powerful. I’ve already critiqued the derision towards so-called “slacktivism” –so common among gatekeepers– in my last post. As I said there, the concept of slacktivism misses the point of online symbolic action. Slacktivism “is not at all about ‘slacking activists’; rather it is about non-activists taking symbolic action—often in spheres traditionally engaged only by activists or professionals (governments, NGOs, international institutions. ).” Rather than being pointless, such overt political displays –easily visible to one’s social networks; easy to share, to participate and to comment—provide a potential new path for ordinary people to have their voices heard in the public sphere. Symbolic action can certainly matter if the topic is important and the moment is right. And the Israel-Iran campaign could be such an example, depending on internal political dynamics is Israel and how widespread the dissent really is. So while the outcome of all this is still uncertain, one can certainly hope that it is harder to sustain a rhetoric of inevitable war against a country when, along with funny videos, pictures of pets, children and sunsets, their citizens are declaring their love for you on their status updates. This entry was posted in Uncategorized on March 20, 2012 by zeynep. This is a great post: thanks! I’m thinking about the radio comparison. The fate of radio was to become a broadcast, one-to-many medium (with the politically not very significant exception of CB and ham operators). TV was always such a medium. The internet and social media are for now many-to-many media. We see attempts by states and corporations to exploit these media for propaganda, to subvert their many-to-manyness through various techniques – sock puppetry, advertising blitzes etc. Do you think the sheer volume and speed of internet-borne messages are such that the elites who took over radio will not be able to do the same with these newer media? I appreciate your video, the message is powerful and I forwarded it to friends. My wish is that Israelees and Iranians make friends with God’s creation, cats, dogs, red fishes, pets! Pets industry is expanding, people are more aware of the importance of the animals life and I wish you could value animals life as well. Wouldn’t it good to see a photo of your family with a pet ? I shared this topic on my face book page. We Iranian don’t want war Either. Thanks So much Because your nice website and your nice sentences , We, Iranians love you too and we want just peace between you and us , We respect you and your religion as we did in past . No matter what the governments want to do , We , both nation want peace and we will make a deep relationship again between our countries . Unfortunately, most people are leaded by their governments to points where the leaders wants to reach without taking in consideration the real “spirit” of the nation. The ambitious and completive persons (the leaders), motivated by their enormous ego are pushing the nation to disasters, controlling the resources and military nation’s power to reach their objectives without any democratic consideration with the “silence” majority. May be (I do profoundly hope) that the Internet communication will give a chance to overcome that sad situation, showing the leaders the real spirit of the nation. For the last 25 years I live out of Israel and I met people from all over the world, among them I have an Iranian guy. From the first time we met we spoke about the relationship between Israel and Iran and we agreed the common population have nothing to do with the conflict between the leaders. I can tell you we passed a good time at our social events with others friends although he is Iranian and I’m an Israeli. Excellent post! 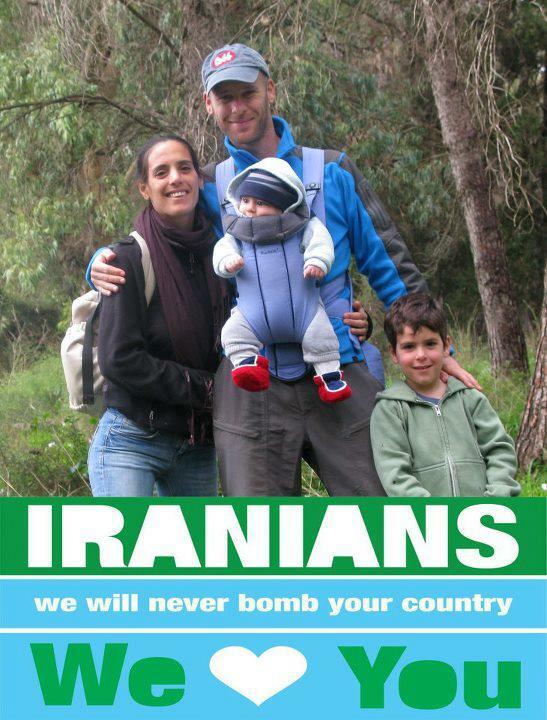 I have to say that it’s good that some Israelis have started this campaign. We should at the same time keep in mind that it’s the Israeli government that is belligerent toward the Iranians. Iran has NEVER threatened to pre-emptively attack Israel. Just today Netanyahu again threatened to bomb Iran because according to him the “sanctions are not working”!! Also, it wouldn’t be a stretch to point out that most Iranians, just like most of the muslim world, including Turkey, have a very serious problem with how Israel treats palestinians. 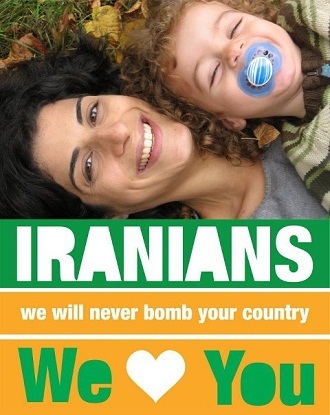 So if there isn’t a similar “we love you Israelis” campaign, it’s not because Iranians prefer conflict or are “un loving”, it’s because there is a very serious fault with apartheid type policies that most Israelis profess to, namely zionism. I never understood how they can keep a straight face and call themselves a democracy when they occupy a place, chase away the inhabitants and refuse to let them back in, arguing if they let the refugees back into their homes, zionism would cease to exist! If they manage to create one State and live in peace with Palestinians and allow millions of Palestinian refugees back into Israel with equal rights for Jews, Muslims and Christians, and form a real true secular democracy (unlike the pseudo democracy they have right now), then I’m sure we’d see many “we love you Israelis” facebook campaigns as well. I do not want this blog or letters to devolve into propaganda rants. Suffice it to say that we need to be wary of official and unofficial propaganda hiding behind the veil of “objectivity”…. [ just ask the Gays and Bahais in Iran what they think…] …. got my message….. It is a thought provoking piece on a campaign that was later criticized, it was argues that it was patronizing to some extent. There were also posters on Facebook mocking the campaign: “we will never bomb your country – gee thanks!” Of course the argument in your piece does not really depend on the content of this particular campaign but in a way is validated by the fact that ‘ordinary’ citizens as well as artists, journalists and so on could find an immediate way to respond and they were heard as well.